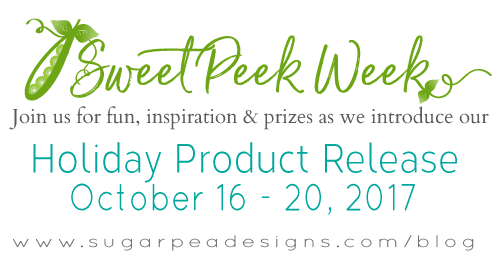 Welcome to Day 2 of SugarPea Designs' Holiday Release Week Sweet Peeks. Today we have a set that really spoke to my accountant-heart - it's a grid to make a bar chart! YAY! I stamped the chart in a pale grey so that the bars would pop in festive colours. So after making my bar chart, I started thinking about how else to use these stamps. How about one of the bars as a base for your focal image? Or the grid as a background (think embossed in gold!!). Or colour in the squares to make a pixellated image? Fun! So even if you're not a chart-geek, there's lots of reasons to love this set! these are both adorable! I was thinking of all the mathematical people in my life who would love this set. My CEO, my CFO, my Son, my Husband, lol, this works for so many people. I love your chart with Santa flying over. That still speaks to the "child" in me. Plus those adorable penguin......Nicely done. Adorable card. Love the sleigh over the chart. Fabulous cards ! Both very different but so inspiring ! I especially love your second one, so clever and so, so cute ! Thanks so much for sharing ! I love both your cards. Nice work! Love them both! Santa an the reindeer made me laugh out loud. Thanks so much. Ardyth, both of these are wonderful! Super cute! I just love the hugging penguins. Wow! Super cool funny and sweet cards!!! Fabulous cards! I love how you used Off the Charts. Everyone is showing off that set so beautifully! oh those cuddly penguins..so cute. Wow...two amazing cards. Love them both! This such a great set and those penguins are adorable. The chart card is very unique ! Super cute cards. Love the clean, simple lines. Your card with the grid is so cute with Santa flying over the top! The penguins are just adorable! Two great cards, love the santa and sleigh above the graph! Love the Santa going over the chart!